Dr. Jennifer Robinson’s primary responsibilities include teaching student pharmacists in the Leadership course and Top 200 drugs. She is the director of student services and experiential education for the college of pharmacy. Robinson’s areas of interest include leadership, innovative teaching methods and clinical community practice. 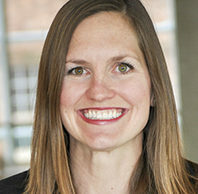 Robinson graduated with her Doctor of Pharmacy degree from WSU in 2005. She was the manager of Jones Pharmacy in Spokane, Washington, until 2008 when she joined the faculty at WSU. She is a clinical associate professor in the department of pharmacotherapy. Robinson serves as a peer reviewer for the American Journal of Pharmacy Education, the journal Currents in Teaching and Learning in Pharmacy, and on the editorial board for Drugs in Context. At WSU, her committee service includes scholarships, commencement, student orientation, white coat ceremony, and others. She is the chair of the admission committee, and the experiential advisory board. Washington State University College of Pharmacy Commencement Hooder, May 2015. Washington State University Teaching Academy Member, initiated December 2014. Phi Lambda Sigma Pharmacy Leadership Society, faculty initiate, 2014.